Filmed for the famous German TV series Rockpalast at MIDEM in Cannes on January 29th, 1986, Pete Townshend's Deep End were touring in support of Townshend's solo concept album White City: A Novel. Back in 1982, the Who embarked on their ”Farewell Tour”. On the day I write this in October 2016, the Who will perform at a massive festival called “Desert Trip”, just one of scores of performances on a “50th anniversary” tour that started almost two years earlier. In other words, the Who’s 1982 “farewell” didn’t stick, but I won’t beat that dead horse much. I bring up their intended-upon dissolution to set up a discussion of lead Who songwriter/guitarist Pete Townshend’s solo career, the subject of a 1986 concert found in Face the Face – Deep End Live. Townshend toyed with solo work while still part of the Who – indeed, he put out four albums under his own name before the Who “split” in 1982. The first two – 1972’s Who Came First and 1977’s Rough Mix - made only a minor dent in the charts, but 1980’s Empty Glass turned into a real hit. Buoyed by the top 10 single “Let My Love Open the Door”, Empty Glass peaked at number 5 in the US and earned considerable critical praise as well. 1982’s All the Best Cowboys Have Chinese Eyes fared less well but still did okay – at least commercially. The album received weak reviews but managed to chart at number 26 in the US, which seems decent. That feels especially correct given that it came out less than three months before the Who’s It’s Hard, and one assumes the hype about the Who’s “farewell” took away attention from Townshend’s solo work. With the Who officially defunct – we won’t hold a July 1985 appearance at Live Aid against them – Townshend formally embraced his life as a solo artist with November 1985's White City. A concept album in the vein of Tommy and Quadrophenia, it followed in the footsteps of Cowboys, which meant a chart peak at 26 in the US – probably a disappointment given expectations for Townshend to prosper on his own after the Who. Townshend never really embraced live performances as a solo artist, so Face the Face offers a rare opportunity to see him on stage without the Who. Shot in early 1986 for the German Rockpalast TV series, Face covers various aspects of Townshend’s career. As expected, we get a fair amount of material from White City: “Secondhand Love”, “Give Blood”, “Hiding Out” and “Face the Face”. Another 1985 song, “After the Fire” was written by Townshend for use on Roger Daltrey’s solo release Under a Raging Moon. “Slit Skirts” and “The Sea Refuses No River” come from Cowboys, while “Rough Boys” and “A Little Is Enough” stem from Empty Glass. The show includes three Who tunes: “Won’t Get Fooled Again”, “Behind Blue Eyes” and “Pinball Wizard”. Pink Floyd singer/guitarist David Gilmour plays with Townshend for this show, and the concert presents his 1984 track “Blue Light”. Finally, we locate covers of Screamin’ Jay Hawkins’ “I Put a Spell On You” and Jimmy Forrest’s “Night Train”. As a setlist, this becomes a good mix of tracks. While I suspect Who fans probably would’ve liked more of that band’s songs, I understand Townshend’s desire to emphasize his burgeoning solo career. And Townshend delivers a pretty solid setlist in any case. Obviously a more Who-heavy show would boast stronger songs, but Townshend cherrypicks his solo work to a satisfying degree. Sure, we find a few clunkers – “Hiding Out” flops, and “Face the Face” feels like a self-conscious, failed attempt to launch a rock/big band hybrid – but most of the songs work pretty well. It helps that Townshend’s band add life to the tracks. Dubbed “The Deep End”, the musicians prove able across the board, and they help accomplish some interesting new spins on songs. For instance, “Won’t Get Fooled Again” uses horns in a surprisingly exciting manner, and other tunes hold up well on stage. As for Pete himself, he acts as a competent front man and no more. With the Who, Townshend provided a stellar, forceful stage personality, but he never needed to serve as the band’s focal point. Stuck in the solo spotlight, Townshend seems somewhat unsure of himself. Pete doesn’t flop in this role, but he doesn’t grab the audience’s attention like he should. It’s no coincidence that Pete looks loosest and most engaged during “Blue Light” – when he cedes the lead to Gilmour. Despite Townshend’s minor lack of frontman presence, Face the Face works pretty well. I went into the show with some skepticism – I never took to Townshend’s solo career and wasn’t wild about a show with so much of that material. Even with some sags, though, this becomes a good little concert. 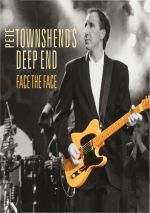 Pete Townshend: Face the Face – Deep End Live appears in an aspect ratio of 1.33:1 on this single-sided, double-layered DVD. Due to those dimensions, the image has NOT been enhanced for 16X9 televisions. Given the show’s origins, it looked okay. As one might expect from a concert videotaped in 1986, sharpness varied. At best, the program showed fairly nice clarity and delineation, but it could go soft on more than a few occasions. With circa 1986 video capabilities, inconsistent delineation became inevitable, so I found the sharpness to seem acceptable. No shots came across as especially tight, but the image never looked terribly soft either. Only mild issues with jagged edges and shimmering occurred, but I saw occasional edge haloes. No source problems materialized. In terms of colors, the lighting offered the most obvious variation in hues, and these elements tended to be bland. The hues never looked bad, but they lacked much pep and vivacity, as they veered toward the messy side of the street. Blacks were mushy, and low-light shots lacked clarity. Based on its age and origins, this was a watchable show, but it wasn’t better than that. When I shifted to the disc’s audio, I found three separate tracks. The disc offered Dolby Stereo, Dolby Digital 5.1 and DTS 5.1 mixes. These came with various strengths and weaknesses. The DTS track became the most aggressive of the bunch, as it used the surrounds in an active manner. A lot of instrumentation came from the back speakers – probably too much, honestly, as these channels could slightly throw off the balance. Though I didn’t think this was a real problem, I would’ve preferred more restrained use of the surrounds. As it was, they gave the show a less than natural feel. Obviously the standard stereo mix lacked this issue, but it also failed to present a particularly strong image. Stereo elements seemed acceptable but not especially well-placed. Though not monaural-ish, the stereo track didn’t deliver a particularly broad presentation. The Dolby 5.1 mix fell somewhere between these two. Obviously it opened up the soundscape more than the stereo track, but it didn’t seem as aggressive as the DTS version. While the Dolby mix used the surrounds, it showed more restraint. This meant that in terms of soundfield, the Dolby 5.1 version probably worked best – it gave us decent material from the rear without the dominance found in the DTS edition. In terms of audio quality, the stereo track sounded worst. It came across as thin and brittle much of the time. Combine the mushy soundscape and the iffy quality and you can ignore the presence of the lackluster stereo option. As for the other two, I had to pick the DTS track when it came to quality. While the Dolby 5.1 version sounded pretty good, the DTS mix came across as warmer and more natural. Though this wasn’t a huge difference, I definitely gave the nod to the more lifelike DTS track. Because of that, I would select the DTS track as my “go-to” option in the future. Yeah, I preferred the more restrained soundscape of the Dolby 5.1 presentation, but the superior audio quality of the DTS edition compensated. All three mixes had issues but the DTS track worked best. While the DVD itself includes no extras, the packages comes with a CD copy of the concert. It provides the entire tracklist from the show found on the DVD except for “I Put a Spell On You”. Finally, we find a booklet. It provides an essay from Matt Kent as well as photos and credits. It adds a little value to the package.